The World Health Organisation in a guide for action, on alcohol problems in a report on Alcohol policy and the public good state, "Alcohol is a commodity sold largely in the free market, providing pleasure as well as pain and may bring health benefits to some people. How is a balance to be achieved between the two, the cost and the benefits?" Alcohol inflicts a costly and unwelcome burden on the majority of societies, both in the developed and the developing worlds. This has provoked an enormous variety of policy responses ranging from the total prohibition of alcohol to the virtual absence of any purposive public health action. One way or another, the issues surrounding alcohol impinge on almost everyone and on all the main institutions and sectors of society-Governments and legislative bodies, the police and the criminal justice system, the education system, health and social services and the workplace. Alcohol problems are not just problems for individuals; they also impose major demands and costs on society as a whole. At the same time, in most Western countries, alcohol is a commodity sold on a largely free market, providing pleasure as well as pain and may bring health benefits to some people. How is a balance to be achieved between the pleasure and the pain, the cost and the benefits? The answer to this question will depend largely on what view is taken of the nature and scale of alcohol problems for societies as well as individuals and how these compare with any health or other benefits. For example: Are alcohol problems restricted to a minority of 'deviant' individuals, or are the harms and pain much more widely distributed? Given that Governments cannot avoid having an alcohol policy of some kind, what approaches to the prevention of alcohol problems can be shown to be effective and what measures are really likely to serve the public good? The nature and extent of alcohol problems. The risks of alcohol consumption in relation to a range of medical and social harms. Some principal factors influencing the occurrence of alcohol-related harm. Effective measures to reduce alcohol-related harm. One thing above all is clear. It is that however wide-ranging and pervasive alcohol problems are, they are not immutable. They do not have to be accepted as 'given', beyond all control. On the contrary, alcohol problems can be ameliorated and do respond to sensible public policies. "Whatever the profits that accrue to societies from the use of alcohol, there are also likely to be substantial entries that have to be made on the debit side of the ledger. "To try to balance the credit against the debit in terms only of economic calculation does not make sense." The cost to everyone concerned of say a man leaving a bar in a drunken state, and killing a pedestrian as against the tax taken from the man's drinking, does not balance like against like. For purpose of the present exposition the data given in the table are entered simply to make the point that whatever the sum of suffering, alcohol problems also have a significant cost dimention that Governments will do well to note". 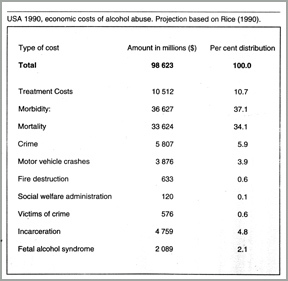 "In the tabl, economic cost of alcohol abuse in USA for the year 1990 are estimated at nearly $100,000 million, with over 80 per cent of the cost related to treatment, morbidity and mortality". 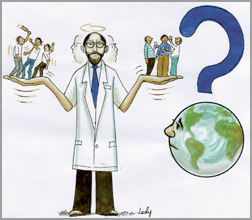 Sri Lankan doctor will chair the tenth Global Forum on Health Research opening in Cairo, Egypt on Sunday October 29. The doctor is Dr. Pramilla Senanayake who is presently the WHO Regional Director for Eastern Meditation. The WHO press release on the event states: Forum 10 - the tenth Forum of Global Forum for Health Research will take place in Cairo, Egypt from October 29 - November 2 under the theme 'Combating disease and promoting Health'. 'How better health research can meet the health needs of the poor and marginalized in developing countries' is the focus of the Cairo Forum. The broad agenda includes sessions on gender equality and health, women's health, road traffic accidents (which are the fourth leading cause of deaths and injuries), innovative challenges in drug development, HIV/AIDS research and successful public-private partnerships (PPPs). The participants include policy makers, representatives of multi-lateral and bilateral development agencies, foundations, non-governmental organisations, pharmaceutical firms and research institutions. The official opening will also have a high level representative of the Presidency in Egypt, Dr. Hatem Mostafa El-Gabaly - the Minister of Health and Population of Egypt, Dr. Hussein A. Gezairy - Regional Director of the World Health Organisation's Regional Office for the Eastern Mediterranean and the Chair of the Global Forum - Dr. Pramilla Senanayake. Prominent speakers at other plenary sessions include Hani Mahfouz Helal - Minister of Higher Education and Scientific Research, Egypt, David Nabarro - United Nations Coordinator for Avian Flu, Seth Berkley - President, International AIDS Vaccine Initiative, USA, Victoria Hale - Chief Executive Officer, Institute for OneWorld Health, USA, Christopher Hentschel - President and Chief Executive Officer, Medicines for Malaria Venture, Switzerland, Robert Ridley - Director, Special Programme for Research and Training in tropical Diseases (TDR), Switzerland and Josefina Bonilla - Executive Director, NicaSalud Network Federation, Nicaragua. Red wine might work to protect the brain from damage after a stroke and drinking a couple of glasses a day might provide that protection ahead of time, U.S. researchers reported. In an effort to better understand how red wine works, the scientists from Johns Hopkins University fed mice a moderate dose of a compound found in red grape skins and seeds before inducing stroke-like damage. They discovered that the animals suffered less brain damage than similarly damaged mice who were not treated with the compound, which is called resveratrol. "When we pre-treat the animals with the compound orally, then we observe that we have a significant decrease in the area of stroke damage by about 40 per cent," said Sylvain Dore, the lead researcher for the study. Dore and his research team presented their results from the study, which was funded in part by the U.S. Government, at a Society for Neuroscience conference in Atlanta. "What is unique about this study is we have somewhat identified what can be the specific mechanism," in the wine that is good for health, Dore said. "Here we are building cell resistance against free radical damage." The study showed that resveratrol increases levels of an enzyme in the brain - heme oxygenase - that was already known to shield nerve cells from damage. Dore said the beneficial effects associated with drinking a moderate amount of red wine could be explained by the fact the the wine turns on the heme oxygenase anti-oxidant system. "Red wine has been suggested for the heart. Here what we show is its special effect in stroke and pre-treatment," Dore said. "It suggests that prophylactic use of wine could work." IQ Linked to long life: (Longitudinal cohort study of childhood IQ and survival up to age 76) Children with higher IQs may live longer, suggests a study in this week's BMJ. These findings add to our knowledge of the personal traits in youth that contribute to survival in adult life. Results of an intelligence test, given to all 11-year olds attending Aberdeen schools in 1932, were used to determine survival up to 76 years. Of 2,230 subjects traced, those who died before January 1, 1997 had a significantly lower IQ at age 11 years than those who were alive or untraced. This suggests that high mental ability in late childhood reduces the chances of death up to age 76. The effect was weaker in men than in women, partly because men with high IQ were more likely to die in active service during the second world war.